So I am settling into my seat in the last row of the aircraft I am about to travel on, and I notice a box that is sitting in the overhead storage area. A box that was there when I came on board. I am sweating my backside off and and reading the box which, as you can read in the picture, is not supposed to be hot. My only thought was "Hope they aren't offering us anything from that box." 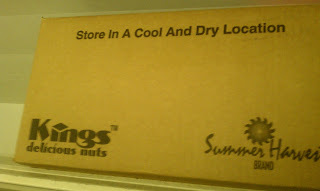 Well that and a brief thought about hot sweaty nuts.